It takes a lot of time and effort to clean up maintenance data. 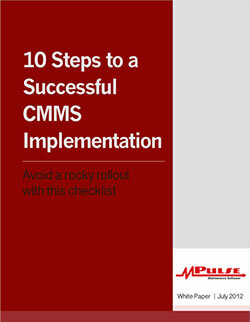 But when you want to start out on the right foot with your new CMMS software—or you’re adjusting things in your current software—clean data is imperative to get the results you want. You have options. Now is the time to review your data and make decisions about what you really need to keep. Your choice will likely be a balance between the need for the data and the time you can afford to clean it up. MPulse customer Manuel debated how much historical data to import during his recent CMMS implementation. His facility previously used an old (and outdated) homegrown database. The data was entered manually for years, and it was incomplete in many cases and inaccurate in others. Manuel could have started from scratch with his new MPulse Maintenance Software. He also could have spent hours and hours cleaning up his old data as much as possible. So, Manual decided to do something in between the two. Manuel focused on his asset records, importing key data like purchase dates and costs into his new CMMS software. He also spent time working through the data on his assets to make sure everything was complete—filling in the blanks and double-checking information when necessary. But he left most of the maintenance history behind. Clean data is the backbone for the real value of CMMS software—analyzing and reporting on key performance indicators for your maintenance operations. Because if your data isn’t accurate and reliable when it goes into the software, it’s not going to be accurate and reliable when it comes out in the form of analytics or reports. Have questions about getting—and keeping—your data clean? Contact us. We’re here for you.